The majority of the TETRAD ranges shown on this page are available to view in our showrooms. 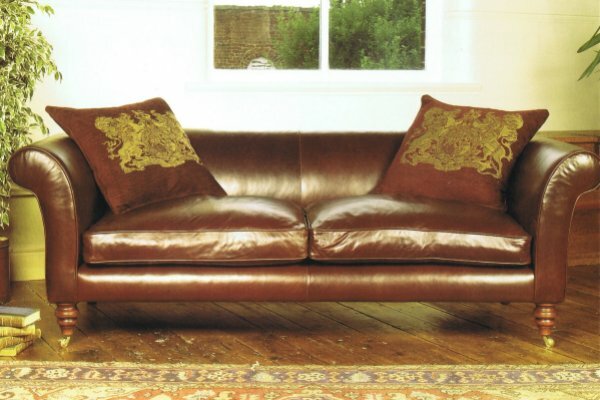 At Harvest Moon we stock Tetrad fixed cover sofas - the finest fixed cover sofas on sale today. 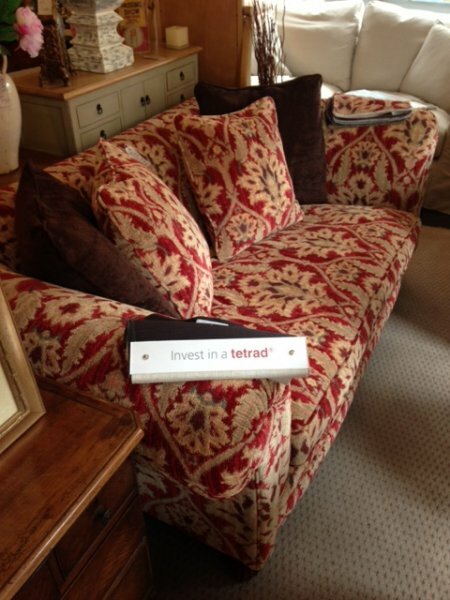 The image below shows the Tetrad Elgar sofa on display in our showrooms. 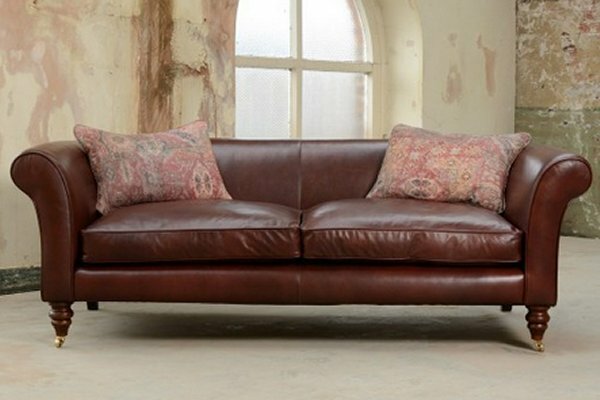 Choose from our range of Tetrad fabric and leather fixed cover sofas as below including the latest additions to the collection the Tetrad Long Island, Highgrove, Brampton, Coniston and Windermere sofa and armchair ranges or come and visit our Tetrad showroom in Southport. We'd love to see you and talk furniture with you. Visit Harvest Moon. 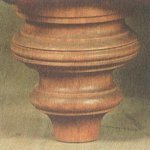 FREE delivery on all TETRAD furniture orders to UK mainland addresses at Harvest Moon! We can also deliver new Tetrad fixed cover sofas anywhere in Europe by dedicated carrier please ask for a quote. 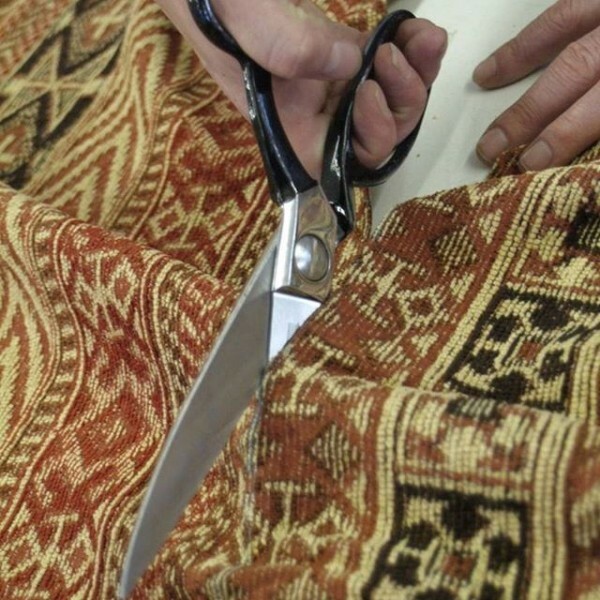 Tetrad pride themselves on crafting high quality fabric sofas right here in the UK. 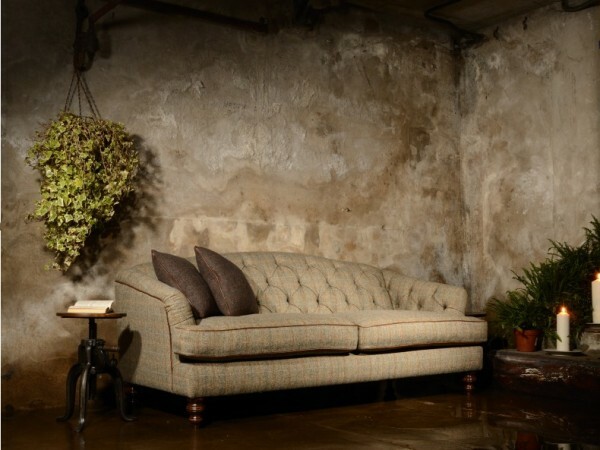 Take a look below and see which of their fixed cover fabric sofas takes your fancy. 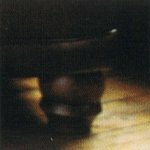 The Elgar stool is shown in the image above in a velvet fabric. The Tetrad Heritage Long Island range is available as a fixed fabric cover midi sofa, a petite sofa, a snuggler, an armchair and a stool. The image above shows the Long Island midi sofa in Lytham Linen Steel fabric with optional scatters. All scatters for this range are optional. 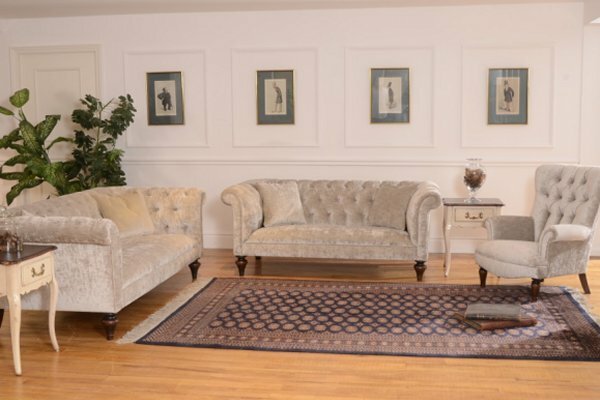 As featured in the "Tetrad Heritage - Coming Home Catalogue" the Tetrad Brampton velvet sofa offers a classic twist on a Chesterfield with a fixed base seat and accentuated curled arms with hand studded detail and turned feet. Contrasting scatters are available as optional extras in Otley Wool - Pebble, Flint, Griffin or Lavender. The image above shows a Brampton midi sofa in Oscar Velvet Teal Green with light oak legs. The grand sofa can also be seen in the image directly above and below in Oscar Velvet Royal Blue with light oak legs and seats 3 or 4 comfortably. 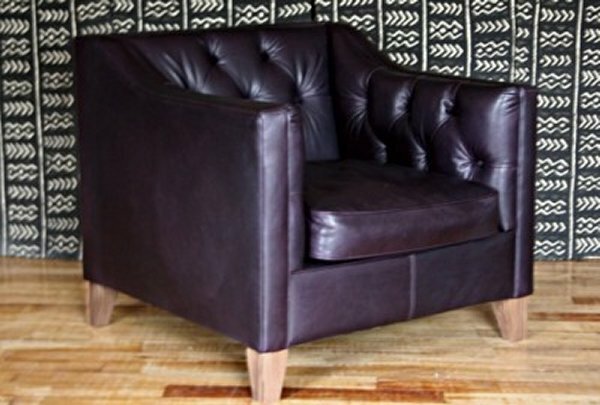 An armchair and a stool, as shown above, are also available to order. 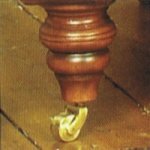 You can choose either traditional dark mahogany feet for your Brampton velvet furniture or light oak feet for a more contemporary look. Otley wool scatter cushions as shown in the images above are available as optional extras in Pebble, Flint, Griffin or Lavender. NEW FABRIC CHOICES - The Brampton range is available in all the Tetrad Oscar Velvet fabric colour options - Dahlia Red, Dusty Pink, Powder Grey, Chalky Violet, Teal Green and Royal Blue and is also now available in all 4 Tetrad Brunel Linen fabric colour options as shown in the image to the left, which from left to right are Natural, Chocolate, Plum and Steel and over 40 more fabrics! Click here to see the full selection of fabrics available. The Tetrad Brampton stool shown here, in the image above in Oscar Velvet Teal Green with light oak legs, is a stylish deep buttoned large low rectangular stool to finish off the look. The image above shows the Tetrad Brampton armchair in Oscar Velvet Teal Green with dark mahogany legs. 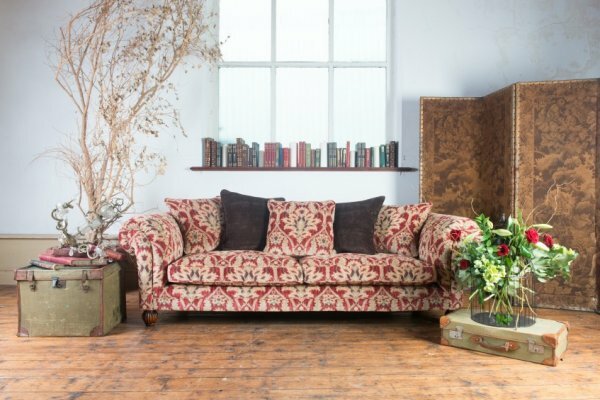 The image above and below shows a Coniston velvet midi sofa in Oscar Velvet Dahlia Red with light oak legs. Contrasting scatters are available as optional extras in Otley Wool Pebble, Flint, Griffin or Lavender. 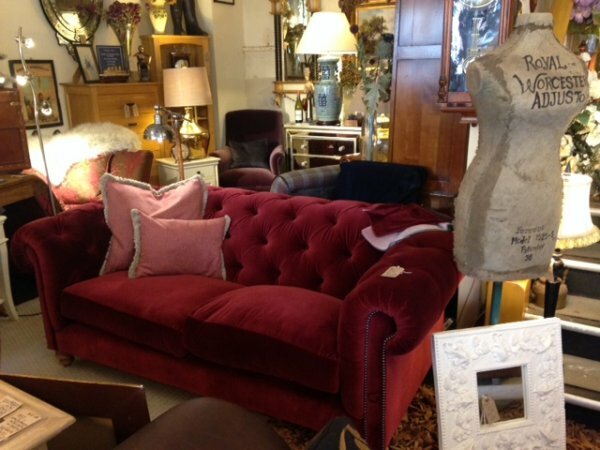 The Tetrad Coniston sofa is a velvet Chesterfield sofa fully coil sprung upholstered back, arms and seat with pure duck and feather seat inners and hand studded silver detail to the arms and turned legs. 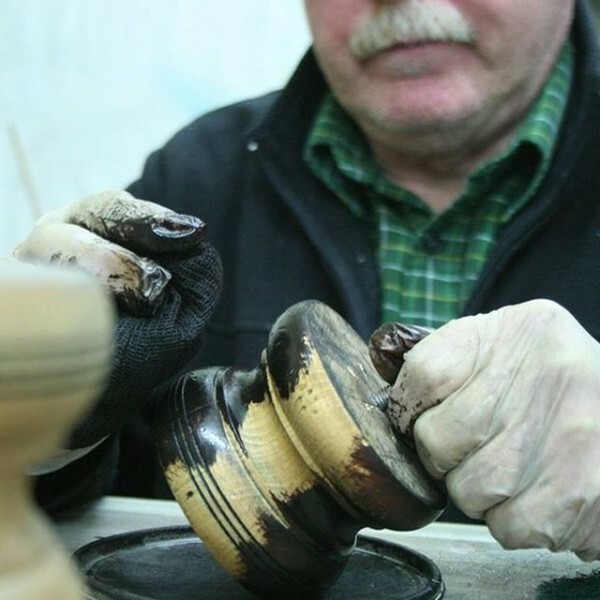 As featured in the "Tetrad Heritage - Coming Home Catalogue". 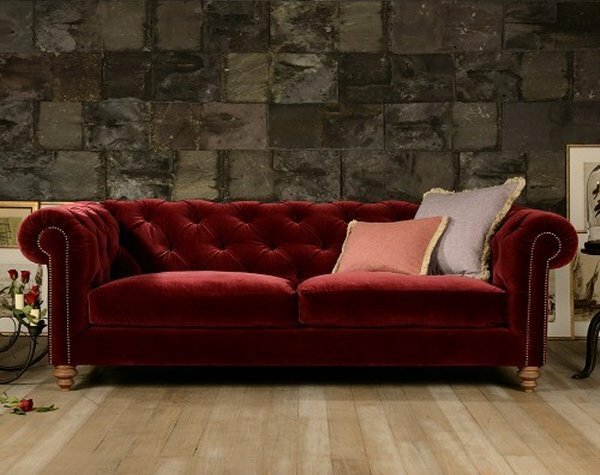 The image below also shows the Tetrad Coniston sofa in Oscar Velvet Dahlia Red with light oak legs and this time it is on display in our Southport furniture showrooms. 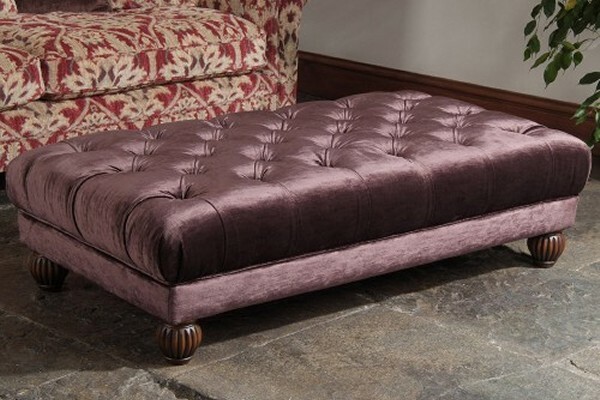 A 2 seater petit sofa and a deep buttoned large low rectangular stool are also available to order. You can choose either traditional dark mahogany feet for your Coniston velvet furniture or light oak feet for a more contemporary look as shown on the sofa above and also on the close up image to the right. Otley wool scatter cushions as shown in the image above are available as optional extras. 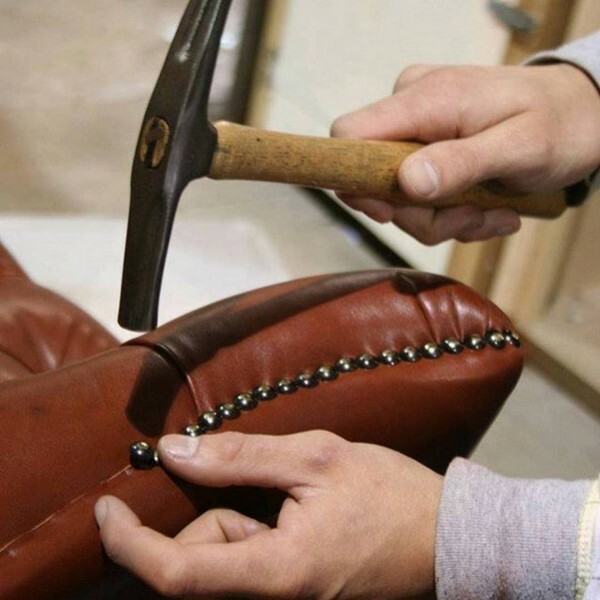 The images to the right show the attention to detail used to handcraft the Tetrad Coniston sofa. The Tetrad Coniston range is available in all the Tetrad Oscar Velvet fabric colour options - Dahlia Red, Dusty Pink, Powder Grey, Chalky Violet, Teal Green and Royal Blue. NEW CHOICES - The Coniston range is also now available in in a variety of Tetrad leathers and all 4 Tetrad Brunel Linen fabric colour options: Natural, Chocolate, Plum and Steel and over 40 more fabrics! Click here to see the full selection of fabrics available. See the Brampton sofa further above for a picture of the Brunel Linen swatches. As featured in the "Tetrad Heritage - Coming Home Catalogue". 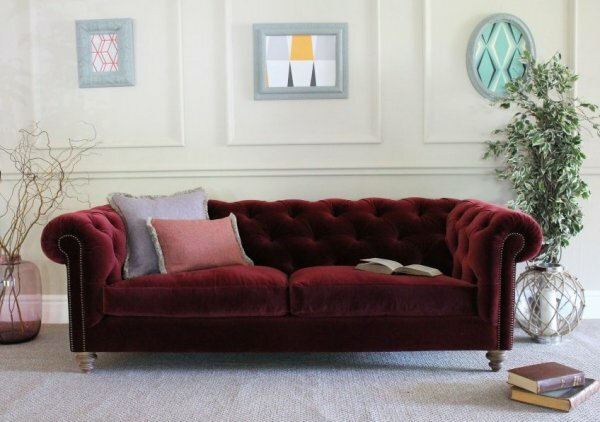 the Tetrad Windermere fixed cover velvet sofa is a nice deep slouching couch still with a smart look but incredibly comfortable featuring low shaped arms for extra comfort. 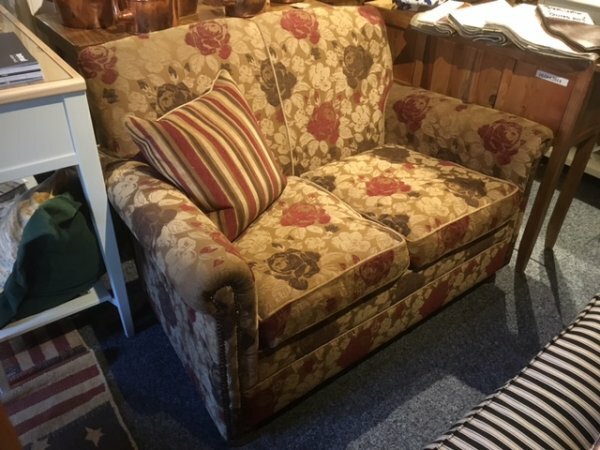 Ideal for curling up on to read a book or watch tv with a nice glass of Merlot. 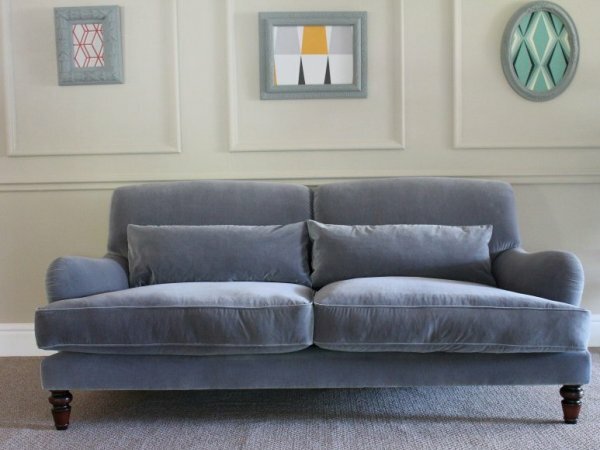 The image above and below shows a Windermere velvet midi sofa in Oscar Velvet Powder Grey with dark mahogany legs. The image below also shows the Tetrad Windermere velvet midi sofa and armchair in Oscar Velvet Powder Grey with dark mahogany legs. 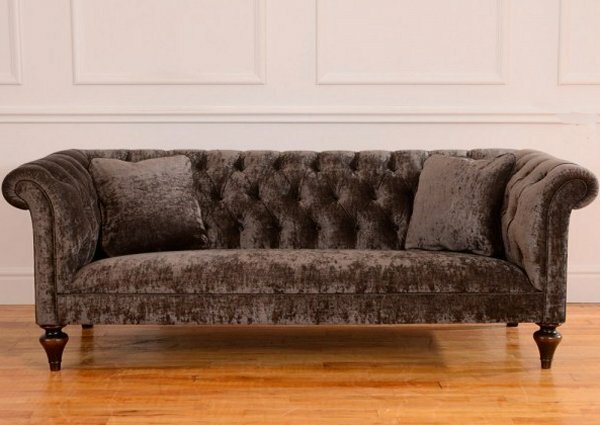 The image above also shows the Windermere velvet midi sofa in Oscar Velvet Powder Grey with dark mahogany legs, focusing on the corner of the sofa and the cushions. 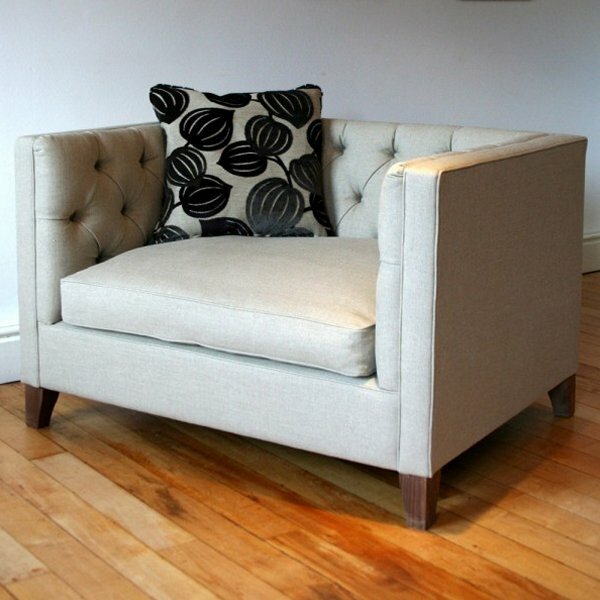 A 2 seater petit Windermere sofa is also available to order. 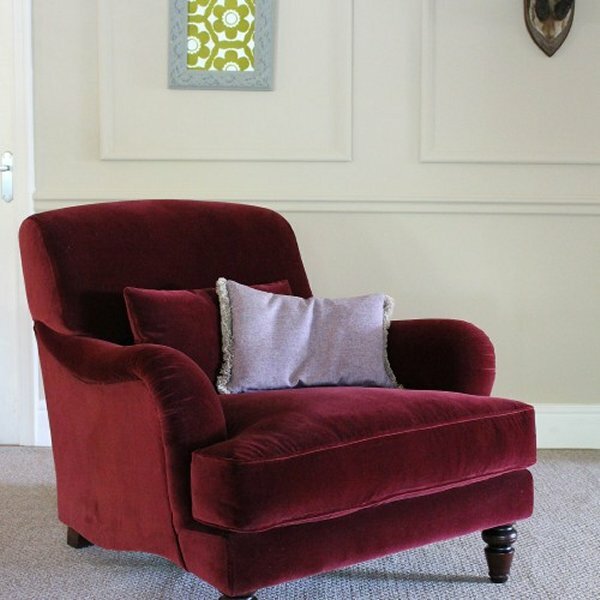 The image above shows the Tetrad Windermere classic fixed cover velvet chair in Oscar Velvet in Dahlia Red with dark mahogany legs. You can choose either traditional dark mahogany feet for your Windermere velvet chair or light oak feet for a more contemporary look. Otley wool scatter cushions as shown in the images above are available as optional extras in Pebble, Flint, Griffin or Lavender. The Windermere range is available in all the Tetrad Oscar Velvet fabric colour options - Dahlia Red, Dusty Pink, Powder Grey, Chalky Violet, Teal Green and Royal Blue. 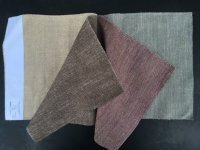 NEW FABRIC CHOICES - The Windermere range is also now available in all 4 Tetrad Brunel Linen fabric colour options: Natural, Chocolate, Plum and Steel and over 40 more fabrics. Click here to see the full selection of fabrics available. The Tetrad Dalmore range as shown in the image below, includes a fabric midi sofa and a petit sofa both with 2 small scatter cushions. 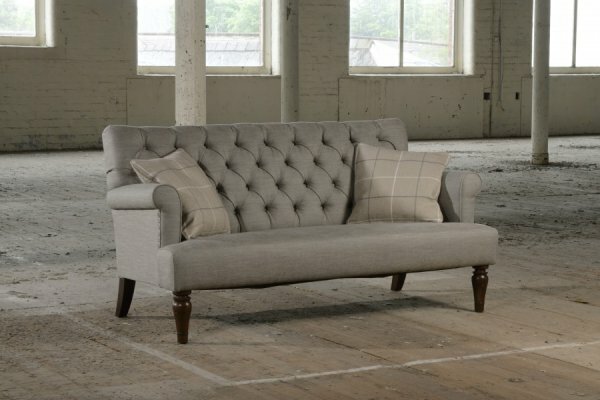 The Dalmore sofas have a sloped studded back and studded arms, the seat is 2 large fixed cover fabric cushions and turned feet. 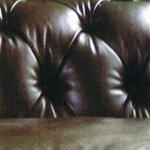 Both sofas are available in a wide range of fixed cover fabric choices and are also available in a wide range of mixed leather and fixed cover fabrics. The image above and below shows the new Tetrad Highgrove sofa in Pendle Mill wool fabric with 3 velvet and wool scatter cushions. 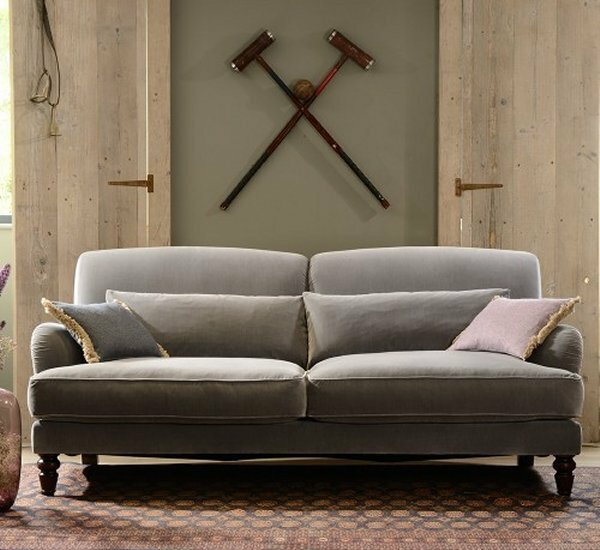 The Highgrove sofa is a fixed cover sofa with scrolled arms and dark wooden legs and is available as either a grand sofa or a midi sofa, the images here show the midi sofa. 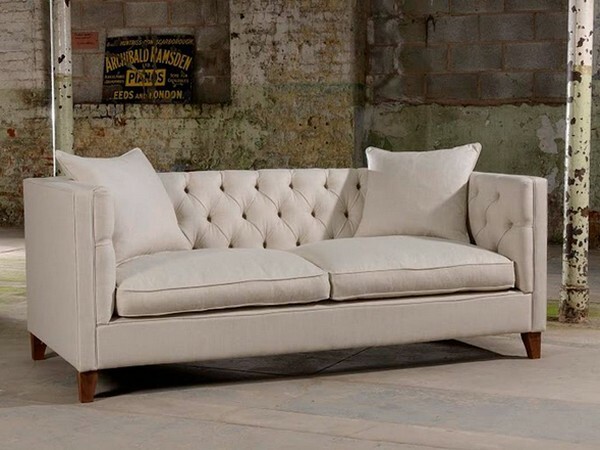 The Highgrove is a modern twist on the traditional Chesterfield sofa. A matching large rectangular stool as shown above is also available to order as well as a mixed leather and fabric armchair and leather small stool. 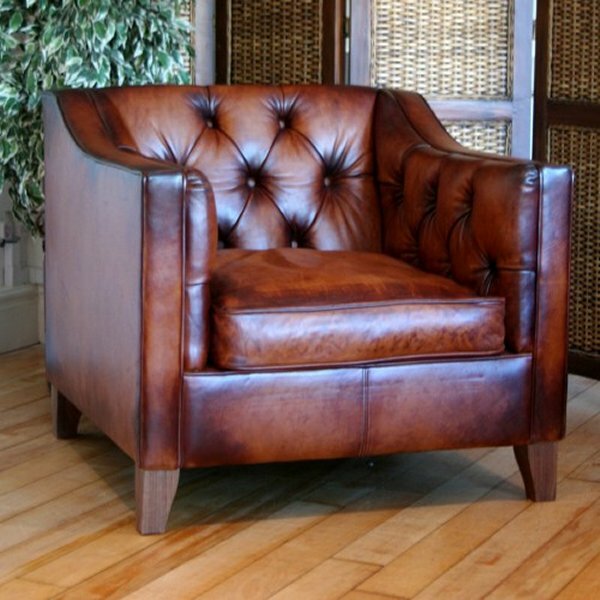 The Highgrove armchair has a leather back and sides with a Pendle Mill wool fabric seat cushion. Optional scatter cushions are also available to order. 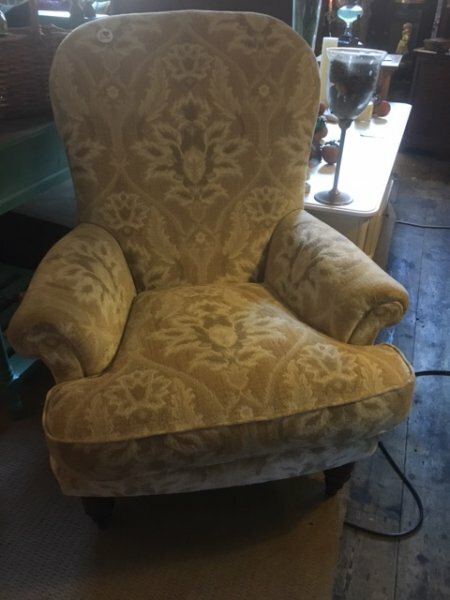 The image below also shows the Highgrove armchair and small stool in the same fabrics as already described above. The Highgrove Heritage range is only available to order in the covers as shown in the images here. 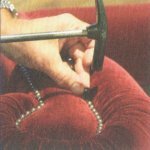 The images above and below show the Tetrad Beaulieu leather sofa. The Beaulieu range is now also available to order in the full range of Tetrad fixed cover fabric finishes as well as all the leather finishes. 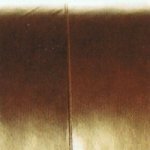 Fabric and leather swatches are available direct from Tetrad on 01772 792936. 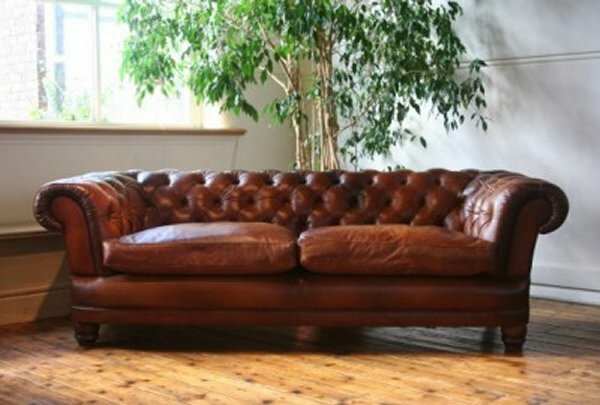 The top image above shows the Tetrad Beaulieu leather sofa in Old Saddle Brown leather. The scatter cushions shown in both images are available as extras, they are not included in the price of the sofa. The Beaulieu is elegant, understated and stylish, whichever adjective you choose the fact remains this sofa and chair range is a pure simple design classic with turned bun feet on brass castors. 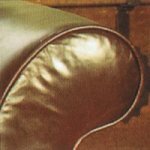 The images above and below show the Tetrad Chatsworth leather Chesterfield sofa. 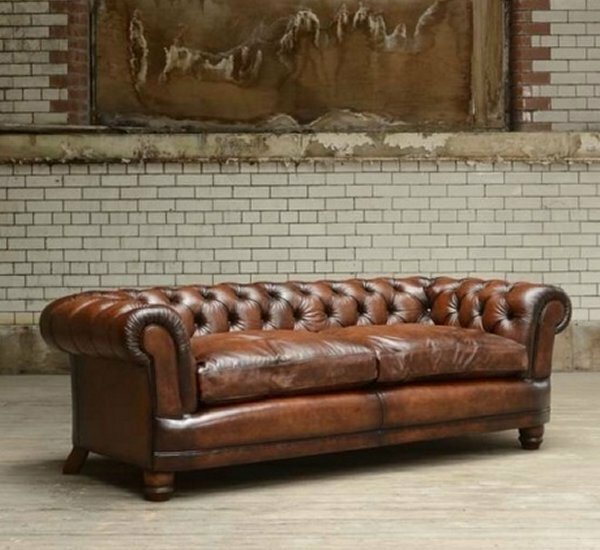 The Tetrad Chatsworth leather Chesterfield sofa can also be seen below in Old Saddle leather on display in our Southport furniture showrooms. Come in and try it! 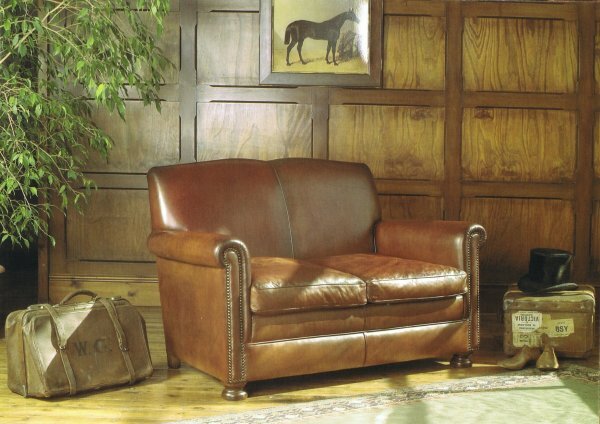 The Chatsworth is a very deep hand buttoned leather Chesterfield sofa with a fully coil sprung back, base and arms. All scatter cushions shown are optional extras. 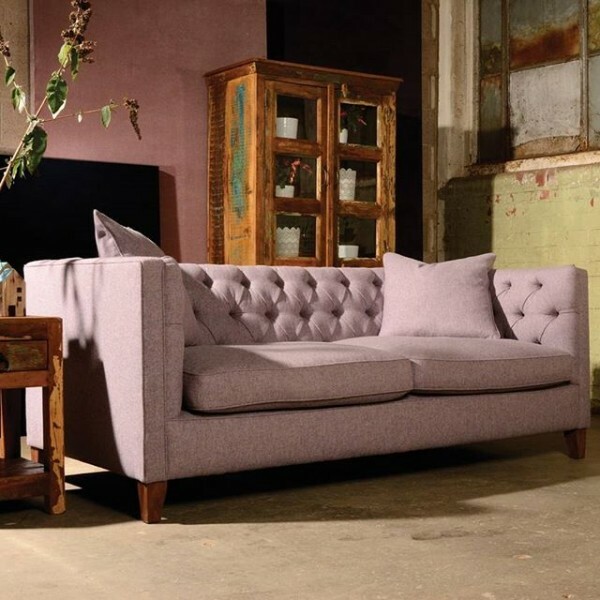 The Chatsworth is a very deep hand buttoned Chesterfield sofa with a fully coil sprung back, base and arms. All scatter cushions shown are optional extras. 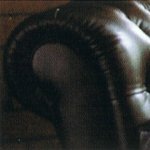 See the two images to the right for a close up of the Chatsworth sofa design. NEW - The Chatsworth range is available to order in the full range of Tetrad fixed cover fabric finishes as well as the leather finishes. The image above shows a Tetrad Prince midi sofa in a fixed cover fabric on display in our Southport furniture showrooms. All scatter cushions shown are included. The Tetrad Prince leather sofa is a compact sofa with studded arms available in 2 sizes. Live in style and opulence whatever the size of your room .. this is just the ticket for those of us not living in mansions! 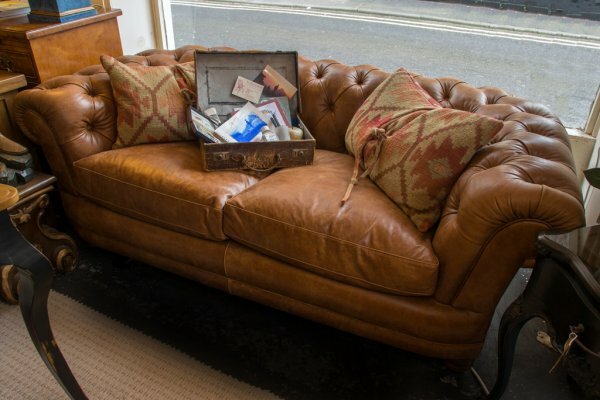 The image below shows the Tetrad Prince leather Chesterfield sofa in Hand Antiqued Original leather hide. The Tetrad Prince range is available to order in the full range of Tetrad leather and fabric finishes. The image above shows the Tetrad Regent fixed cover midi sofa in Plain Fabric - Taupe along with the Regent chair in Plain Fabric - Natural. 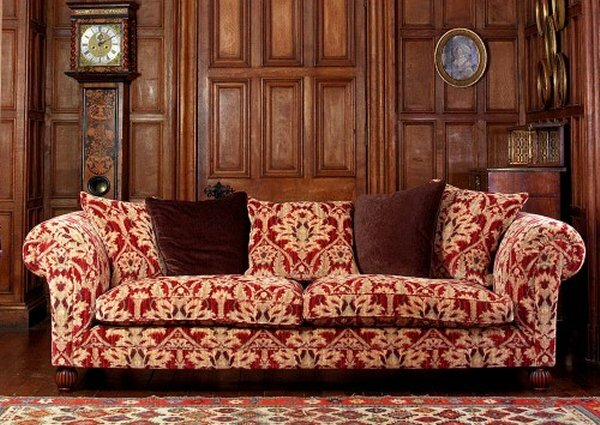 The Tetrad Regent is an elegant button backed design with scroll arms that has been beautifully crafted and is supremely comfortable. 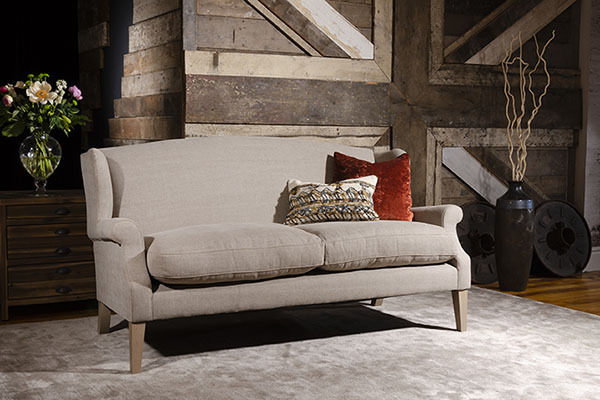 The Tetrad Regent range includes a fixed cover midi sofa, petit sofa and armchair. Both of the Regent sofas come with 2 small scatter cushions. The Regent chair complements both the Pasco and Regent sofas. 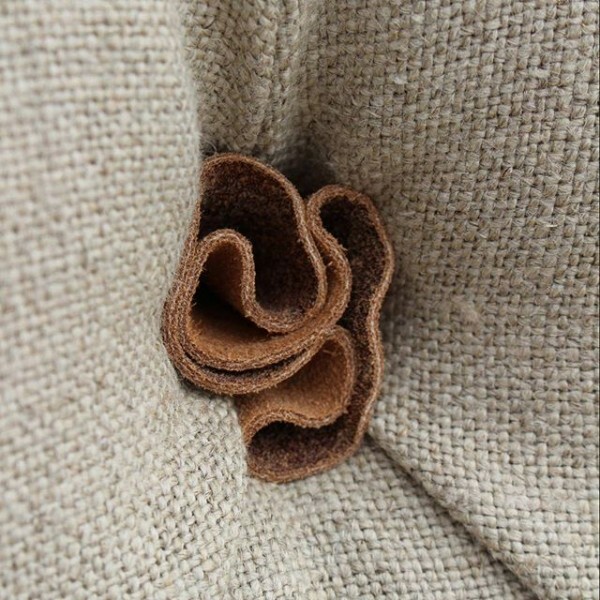 The full list of fabric and colour options for the Regent range are Plain - Taupe, Natural, Bone, Fudge and Chocolate and in Moderna Velvet - Slate, Aubergine, Brown, Shadow and Wicker. Swatches are available direct from Tetrad on 01772 792936. The image above shows the Regent sofa in Modena Velvet Brown and below in Modena Velvet Shadow. 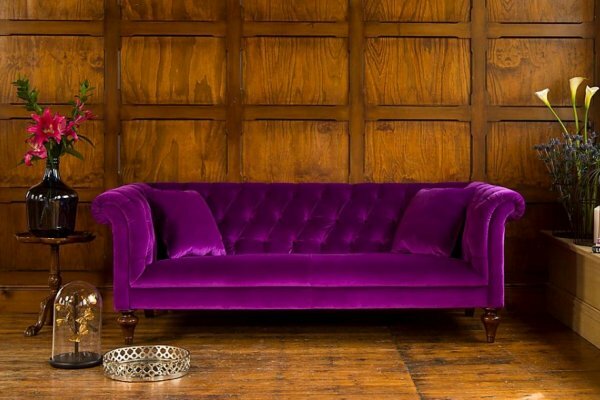 The image below shows the Regent sofa in an exciting new Modena Velvet fabric - details to follow! 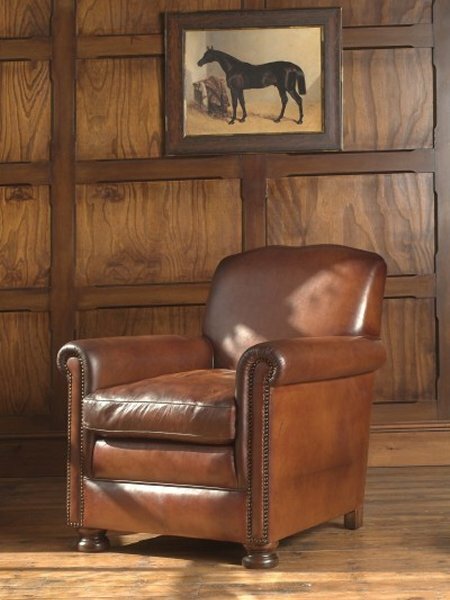 The Regent chair only is also available in leather in the following Tetrad hide options - Picasso - Chestnut, Marco Polo - Chocolate, Miami - Black, Old Saddle - Brown, Walnut, Teak and Chestnut, Artisano - Burgundy and Chestnut and Autumn Leaves - Brown and Chianti. 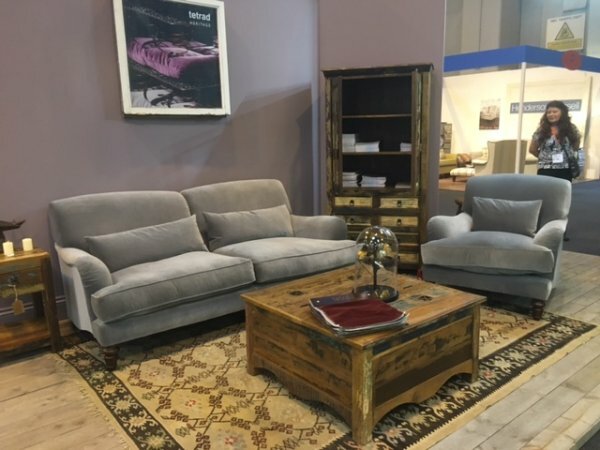 The three images above show the Tetrad Battersea sofa which is a large contemporary sofa with deep buttoned back and sides and genuine walnut tapered legs. as featured in the "Tetrad Heritage - Coming Home Catalogue". All scatter cushions shown are optional extras. 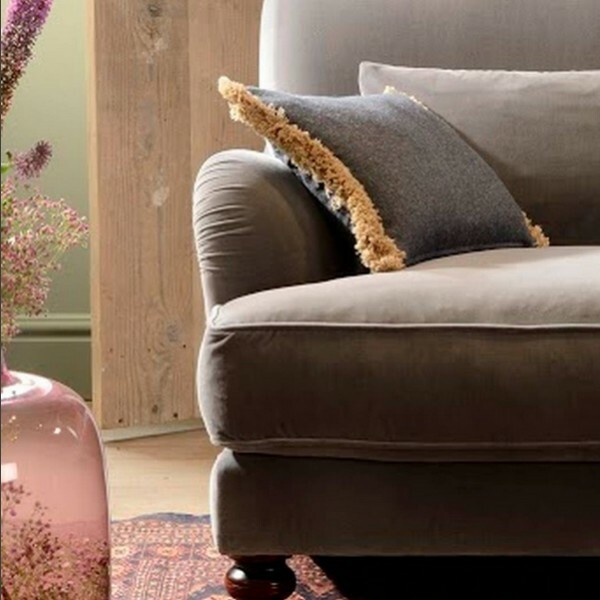 The Tetrad Battersea range also includes an extra wide Snuggler chair which can be seen in the image above. The third item in the Tetrad Battersea range is a standard armchair to match the sofa and snuggler chair, and can be seen in the images above and below and although shown here in leather is available in fabric as well. The image above shows the elegant compact sized buttoned Tetrad Evesham armchair and footstool. 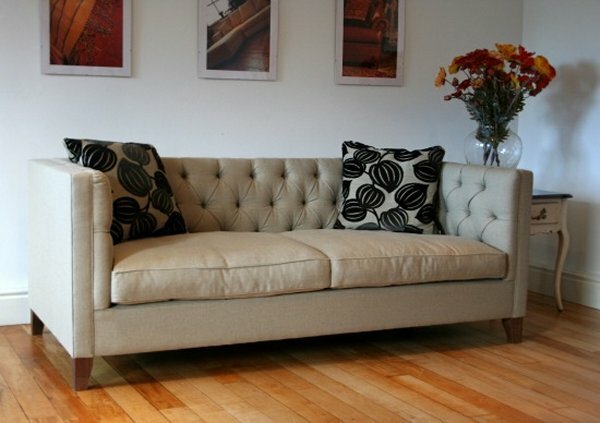 An Evesham sofa is also available which can be seen in the image below in natural Galway plain fabric. All scatter cushions shown are optional extras. The Evesham range is available to order in the full range of Tetrad finishes. Fabric swatches are available direct from Tetrad on 01772 792936.